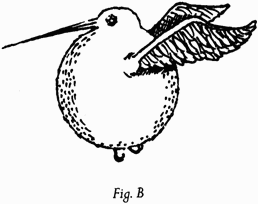 a) The need for a bewitched object capable of providing flight to those wizards not bird animagi (animagi themselves being rare, those with flight capability even more so). “No spell yet devised enables wizards to fly unaided in human form,” he writes, and wizards who are transfigured (by their will or no) into flying creatures like birds or bats, find themselves with the brain of that animal as well, which one imagines might limit the experience; and b) Any object bewitched for flight would need to be discreet and easy to hide, and the portability and inexpensive nature of the broomstick lent itself to the task as well. There is no record of the first person to bewitch a broomstick. 2. Imagine the splinters. — Early broomsticks were neither aerodynamic nor comfortable. They also had limited movability: up, down and stop were pretty much it. 3. Quidditch wasn’t the first broom game, only the one that lasted. — The annual broom race of Sweden began in the 10th century and continues today, but due to its dangerous nature (300 miles long, most of it through a dragon reservation) it’s popularity is somewhat limited. Dated around 1105, a famous painting titled “Günther der Gewalttätige ist der Gewinner” (“Gunther the Violent is the Winner”) illustrates the German game of Stichstock, where players on brooms have to defend an inflated dragon bladder until it was either punctured, or the guardian had “succeeded in hexing all the opponents out of the running or collapsed from exhaustion.” Aingingein was Irish and involved players speeding through burning barrel hoops with a goat’s bladder. (Obsessed with bladders, these ancients.) Shuntbumps in Devon was basically jousting on broomsticks. Swivenhodge (pig’s bladder this time), mostly a children’s game nowadays, involves players sitting backwards on their brooms and hitting the bladder over a hedge. “The players assembled, twelve fine, hearty men. 6. Ouch. — The original bludgers were bewitched boulders. 9. The Snitch was not added to the game until 1269. — The Chief of the Wizard’s Council, Barberus Bragge, brought a caged Golden Snidget to a game and released it onto the pitch, stating that whoever caught it during the course of the game would be awarded 150 galleons (the number of points now awarded to the catching of the Snitch in modern Quidditch). The practice caught on, and Snidgets were soon almost Quidditched to extinction. 10. 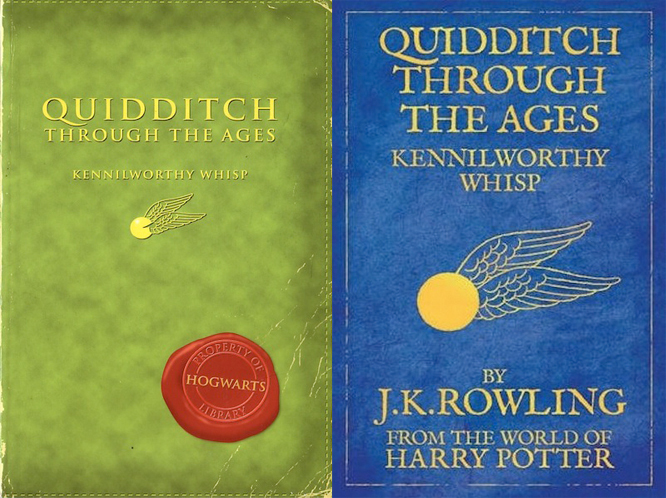 The Golden Snitch was invented by Bowman Wright of Godric’s Hollow. — It was exactly the size and weight of a Golden Snidget, but was bewitched to remain within the confines of the Quidditch pitch. 12. Careless wizards swooping around are responsible for Muggles linking magic with broomsticks. — Well, that one was sort of obvious. 13.The Department of Magical Games and Sports. — Was created in response to the strict measures of the International Statute of Wizarding Secrecy in 1692. Quidditch teams that flouted the Statute were disbanded. 14. Modern Quidditch isn’t played locally. — All teams travel to Ministry approved and prepared locations for matches. Deserted moors are still best. That was the cry heard from Quidditch players across the nation last night as it became clear that the Department of Magical Games and Sports had decided to burn the baskets used for centuries for goalscoring in Quidditch. At this point, the Departmental representative was forced to retreat under a hail of baskets thrown by the angry demonstrators assembled in the hall. Although the ensuing riot was later blamed on goblin agitators, there can be no doubt that Quidditch fans across Britain are tonight mourning the end of the game as we know it. 16. The original Quaffle was not enchanted to fly. — It had straps! 20. There are thirteen professional Quidditch teams in Britain and Ireland who vie for the League Cup. — The Appleby Arrows, Ballycastle Bats, Caerphilly Catapults, Chudley Cannons (who last won the Cup in 1892), Falmouth Falcons, (club motto: “Let us win, but if we cannot win, let us break a few heads.”), Holyhead Harpies, Kenmare Kestrels, Montrose Magpies, Pride of Portree, Puddlemere United, Tutshill Tornados, Wigtown Wanderers (founded by seven offspring of a butcher, who would stand by the sidelines holding a meat cleaver and looking fierce), and the Wimbourne Wasps (whose fans are known as ‘stingers’, and who buzz loudly to distract opposing Chasers when they are taking penalties). GRENOUILLE: I cannot go with you to the market today, Crapaud. CRAPAUD: But Grenouille, I cannot carry the cow alone. GRENOUILLE: You know, Crapaud, that I am to be Keeper this morning. Who will stop the Quaffle if I do not? 23. The United States prefers Quodpot. — It involves an exploding Quaffle, and eleven players trying to get said Quaffle into a pot before it does its exploding. Typical, really. 24. The Cushioning Charm was invented in 1820. — The higher comfort on wizarding bums pushed forward the production of more reliable brooms that could be used to travel long distances or for sporting and racing. 25. Nimbus is the preferred broomstick of professional Quidditch teams. — Although this is most likely out of date. Whisp is due for an update to his beloved book, as I have it on quite good authority that most Quidditch players (professional and non-professional alike) now covet the Firebolt. Gerdie Keddle feels about Quidditch the way I feel about most sports…EXCEPT FOR QUIDDITCH. I’d probably be an Appleby Arrows fan. My favorite thing about Gerdie Keddle is how she only knows the name of one day of the week.